This barley soup is not French haute cuisine as Carême’s recipe is. It is Dutch and was published in Aaltje, de volmaakte en zuinige keukenmeid (‘Aaltje, the perfect and thrifty cook’), a popular cookery book from the early nineteenth century (1803). In fact it was so popular that in 1887 a teacher of house economics, Odilia Corver, thought to profit from its popularity by presenting her own completely new cookery book as the “seventeenth entirely revised edition” of ‘Aaltje de volmaakte en zuinige keukenmeid‘. But to no avail. The original Aaltje had at least twenty editions. The last edition from 1878 was actually labelled ‘the sixteenth’, but from some editions more than one version existed. Corver’s version of Aaltje never had more than two. Although the source of the recipe on this page is Aaltje, it must be noted that the recipe is practically identical to a recipe for barley soup in De nieuwe vaderlandsche kookkunst (‘the new national art of cookery‘) from 1797. 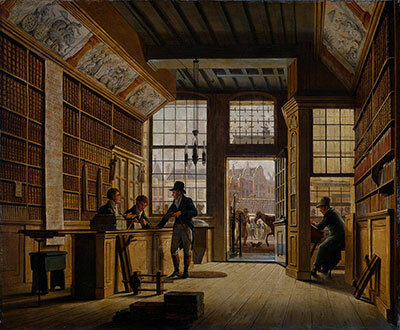 The picture on the upper left depicts the bookshop of Pieter Meijer Warnars at the Vijgendam (‘Fig dam’, today the Damrak) in Amsterdam. It was painted in 1820 by Johannes Jelgerhuis (see the website of the Rijksmuseum). Judging from the austere book spines, the books in this shop are all of a serious nature, but cookery books had the same kind of covers in those days. So maybe Aaltje was present on the shelves. More about barley can be read in the introduction to the recipe for French barley soup. And more about Aaltje and her cookery book can be read in the introduction to the recipe for the Cook’s Salmon Salad. The Aaltje from 1803 was a completely different cookery book from the New Aaltje of Corver’s New Aaltje. But the second edition of Aaltje from 1804 was also different from that first edition (see the recipe for Cook’s Salmon Salad). That is why I have included both versions of Aaltje’s recipe below, from the first edition in 1803 (p.10/11) and the second in 1804 (p.27) respectively. Up until the last edition in 1878 the recipe remained the same. 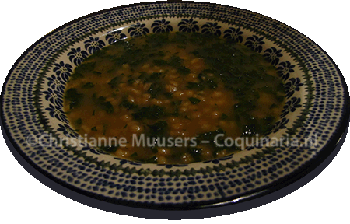 Odilia Corver also wrote a recipe for barley soup for the chapter ‘nourishing soups’ (p.42) in her New Aaltje. That is a completely different recipe however. Her recipe contains stock from ox, veal or chicken and ‘all kinds of vegetables’ like parsley, chervil or endives, some carrots and cauliflower, and just before serving may be eggs may be stirred through the hot soup (like straccialtella). Take celery, chop it finely, rinse it well, after which you braise it slowly with a small piece of butter. Then boil fine pearl barley in water until done, and put everything together in the best stock. Let it cook a little with salt and spices according to taste, and then you will have a pleasant dish. Take, for instance, two and a half part of a quarter fine pearl barley that you boil in water. Then take 1 or 2 bunches chopped and well rinsed celery, that you braise slowly with a small piece of butter. Having prepared this, add this and that to veal stock and let it cook some more with salt and spices as [mentioned] above to satisfaction, and then you will have a very pleasant dish. Very important: soup will never be better than the stock you have used to prepare it. If possible, use home made stock. The spices mentioned in the recipes appear to be nothing more than nutmeg or mace and salt. The Dutch phrase “derdehalf vierdedeel” (litt. thirdhalf fourth part) in the second edition was bit of a puzzle to me. A Dutch pound was about 480 gram in those days. A quarter of that would be 120 gram, but what is a ‘thirdhalf’? A sixth part? That would amount to 20 grams of barley, and Aaltje may be Thrifty, but not to that extent. The large Dutch lexicon WNT solved the problem: derdehalf is two plus half of the third. which is two and a half. So that would be 300 gram barley, and that is exactly what the sixteenth edition from 1878 calls for (“3 onsen fijn gepelde garst”). However… none of the recipes mention how much stock is needed for the soup. My version calls for one and a half liters of stock and 50 grams of barley (before cooking). If you use 300 grams for one and a half liters of stock, you will not have prepared a soup but a stew. Or you must use a lot of stock, which is probably what Aaltje did. First course for 6 to 8 persons; preparation in advance 2 hours; preparation 5 minutes. According to the original recipe the pearl barley is to be boiled for two hours in salted water. But you can also boil the barley in stock. The barley will be tastier, but you’ll need more stock. Braise the celery in butter. Add to the veal or vegetable stock, with nutmeg or mace to taste. Sample the soup to determine whether it needs more salt. This “very pleasant soup” is nutritious, but not a meal in itself. Serve it hot as a first course. Aaltje, de volmaakte en zuinige keukenmeid; leerende het braaden, kooken, stooven, inleggen, confyen, droogen, enz.,van alle spyzen, die ‘er in eene burgerkeuken worden toebereid; op de zuinigste, gemaklykste, en smaaklykste wyze. J.B. Elwe and J.L. Werlingshoff, Amsterdam, 1803, 1st edition (‘Aaltje, the perfect and economical cook’). On Googlebooks: edition 1803, 1845 (and many more). O.A. Corver, Aaltje, nieuw Nederlandsch Kookboek (‘Aaltje, new Dutch cookbook’), 17th completely revised edition of Aaltje de volmaakte en zuinige keukenmeid, 1891. Facsimilé edition Van Goor Zonen, Den Haag, 1978. New edition in 2014. Nieuwe vaderlandsche kookkunst, Bevattende een volledig en grondig onderricht, om, naar den hedendaagschen smaak, toe te bereiden allerleie soorten van spyzen […], door twee in dit vak zeer ervarene huishoudsters. (‘New Dutch culinary arts … by two very experienced housekeepers’) Johannes Allart, Amsterdam, 1797. Facsimile edition uitg. C. de Vries-Brouwers, Amsterdam/Antwerpen, 1976. Text (Dutch) online. Pearl barley is very nourishing, but not very popular. Try this soup, you’ll love it.